I would love a post on how people keep track of work to-dos. Do people write down their assignments on their calendars, keep a paper to do list? Some other system? Great question, E! We’ve talked about different tools for time management, how to organize your office, as well as how to choose a great planner, and how to find a system like Getting Things Done, but I don’t think we’ve talked about how to keep track of different work to-dos. My own system is kind of simple (she said, preparing multiple bullet points) — OK, it’s not terribly simple, but it KIND of works for me. I could definitely improve, though, so I’m curious to hear what works for you guys! Brain dump. I tend to have a thousand little thoughts roaming around my head at any given moment (I joke that I’m one of those people with 72 tabs open in my brain) and they often interfere when I’m trying to focus on whatever task is at hand. So I like to take a piece of scrap paper and brain dump as much as possible into several lists: personal, business, and delegateable. As I go through my tasks, when any little thought comes into my head, I just scribble it on the paper and move on. At the end of the day I try to delegate what I can, and assess priority/steps involved for the other things I scribbled down throughout the day. I’m a big believer in batching tasks that are similar, such as calls, errands, low energy tasks (like researching or light reading), or “2-minute” tasks (where “it’ll just take 2 minutes”). Where possible, I keep a master list of tasks to do based on these brain dumps. Keep action items from meetings. Something I’ve done since my lawyering days has been to take a Post-It with me to meetings and keep track (separately from my meeting notes) what action items needed to be done after the meeting — I still do this today with meetings and phone calls. At the end of the meeting I can quickly see what needs to be done, who’s said they’ll do it, and, hopefully, by what time — these action items will be ultimately added to the master to do list. Automate what you can. I’ve written before of my love of Remember the Milk, and I still use the program to try to keep track of different things — particularly recurring to-dos. If you need to check in with a client once a month, add it to a to do list — if you need to get your billables in by X date, add it to the to-do list. You can also do this if you prefer a paper planner method. (Personally I tend to only use Evernote to keep track of articles I might want to find again (other than recipes or more visual things, which is how I personally use Pinterest) but a lot of people like to use Evernote for planning/action purposes.) If you’re someone who loves to use Siri to boost your productivity, I believe the ToDoist app works with Siri (and Alexa, although possibly with the help of an IFTTT recipe). I’ve always experimented with “inbox to-do list” methods (where the only stuff in your to do list is stuff that you need to respond to) as well as folder methods (like GTD) — as well as, for lack of a better term, “category” methods (for example, I know that at any given moment for the blog I ought to be thinking about 7 or 8 different categories of things, from new content, advertising, tech issues, refreshing/using old content, answering emails, etc) and in theory I should have balls in the air for each of those at any given moment or have delegated balls to be in the air for each of those at any given moment)… but, well, those methods haven’t been that successful for me; only the stuff in the bulleted list has worked for me to keep track of various work to-dos. I’m curious to hear about you guys — especially people who have 10,000 clients, projects, bosses, and more! 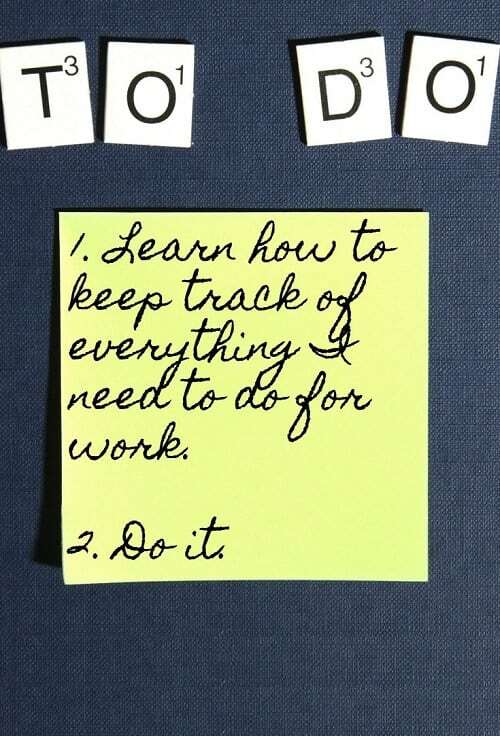 What do you do to keep track of work to-dos? Do you take pleasure in crossing things off on paper or clicking a little bubble that makes things disappear? Do you also move to-dos from list to list? How do you keep track of work that you’ve delegated to others? 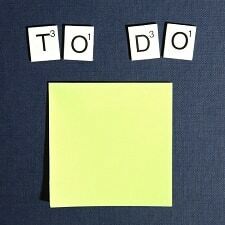 What system to keep track of work to-dos works the best for you? I use a Dapper Desk legal pad (from Emily Ley’s Simplified Planner collection). I record my time in 15 min increments on the left side of the page and my ongoing to-do’s in the right column, crossing off each task as I complete it (and usually adding a subsequent task to the end of the list). At the end of each day I take a few minutes to review where I’m at with all of my clients and either move the remaining tasks to the next day or later in the week, or, if I’m waiting on something from a client, etc. to move forward, enter a task on my work calendar to check back in, say, a month if its non time-sensitive, the next week, etc. Don’t forget, if you’re using outside software like Remember the Milk or Evernote for your work to-dos, you may be running afoul of your employer’s policies. I’m a fan of the inbox to-do method. The only emails that sit in my inbox are actually unread, or action items. As I read emails, I either: delete if it’s junk or an FYI; take action and then delete or file; flag for followup and leave in my inbox if it’s something I can’t resolve immediately. I use Outlook tasks for non-email to-dos, so they live right alongside my emails. I also use a color coding system with a different color for each case– I use email filters to automatically color code most emails as they come in. I started using Outlook because it was the only app my firm would allow to sync with my phone for security reasons. But I really kind of like it. So much of the inputs throughout my day are email-based, and I hate paper, so I like having all my tasks on my desktop and my phone in the same place. Fellow paper hater. My supervisor is big on paper lists and reminders, and she actually accused me of being disorganized because she never saw me using paper! I had to explain that everything is on my computer or phone. I use a two methods – one for email and one for everything else. For email – I use flags and categories in Outlook. I use the reminder feature extensively. My general goal is to deal with an email as soon as I read it, and I usually succeed. For those emails where I can’t, I flag them and may add a category if it fits something I’m tracking. For everything else, I live and die by my OneNote notebook. OneNote is a Microsoft product that is a remarkably useful and faithful electronic representation of a notebook. I specifically use a To Do tag and an Action Item tag. Then I use the tag summary page feature to pull all of my open items into one linked list. Mind blown. I’ve learned to utilize OneNote more and more in the last year, but now I really want to play around with these tags. 1. My Outlook calendar, which syncs with my phone. I add events the moment they’re scheduled. 3. My “Later” folder in my inbox, where everything I have to deal with gets transferred to. 4. My OneNote page of all of my cases and what needs to be done on them- a bigger picture to-do list. I also have a Moleskine notebook where I write to-dos if I have some downtime, and is the place I keep ALL of my written work/personal notes. I transfer to-dos to my daily page, which is a page I made with to-dos, to-calls, timekeeping tracking, workouts, notes, and tomorrow’s to-dos. I print 5 per week and use them each day, and then file them at the end of the week. Outlook is my biggest saviour. I practice inbox zero religiously, and use flags to remind me to follow up with important stuff. I file all my emails in different folders to stay organized, and use the calendar for meetings and appointments. But if there’s something little I need to remember, I just write it on a post-it and stick it to my monitor! Along these lines, what software do you like for team project management? I need something that integrates well with Outlook and other Microsoft softare – but it does not need to be Micrsoft. I really like Trello, although it isn’t the best at integrating with Outlook. Moving around the little cards is very satisfying! We use Basecamp at work. You can modify everything for personal preference and based on the particular project. All messages, comments etc. are sent to your Outlook email (unless you turn off the notification) and you can respond directly in the email without going into the application. They also now have an Email Forwarding feature. It’s very user friendly and has other software applications you can link to it. Oh, and a phone app! If you’re looking for Microsoft integration, Planner is basically exactly like Trello. You can create teams, set deadlines, assign tasks, update timelines, etc. And it works with Outlook email and calendar beautifully. What I want to do/what I do when I am not slammed: use one hand written to do list that I update each day before I leave + unread emails. I use a day designer with a daily layout. I use the to-do list as my running tab of things to take care of. I’ve considered using a bullet Journal, because it might be more useful for my needs. I would be really interested in hearing from people who have used bullet journals on whether they found them helpful or not. I also work somewhere with electronic case management software that keeps track of everything that has happened in my cases, though that isn’t workable as a to-do list. I tried bullet journaling and it took a LOT of time. I’ve kind of made my own by making my own daily-pages that have everything I would want in a bullet journal, but they’re just printable pages I file each week. I use a modified bullet journal system and love it. I started using it during an insane period of work and I’ve never looked back. When I first started I followed most of the guidelines suggested by the bullet journal website, but over time I became more flexible and adapted it to a way that works best for me. Its so helpful to have notes from calls and meetings in the same location as to dos, projects, etc. And on numerous occasions it has been helpful to refer back to notes from a previous call or meeting in order to address something new that’s come up. I have nothing productive to add, just want to say “hi” to a fellow legal aid lawyer! I have used a bullet journal for a year and a half and it saves me. It isn’t pretty or fancy. But I love that I can just turn the page, and add whatever I need, then reference it in the index. I use a weekly spread instead of dailies so I can split my task up over the week and see all I have to do in both meetings and tasks. I still put meetings in my online calendar for reminders and use inbox zero with folders and a “waiting for” file on anything where I expect a response. I keep a running “to do” draft email in my Outlook. I spend 15 mins. updating it on Sunday evenings by breaking out the next week’s tasks into a Monday/Tuesday/etc. list within the email, retaining a longer “Other” list at the end for all of my longer-term projects and any tasks I don’t think I can fit into this week’s schedule. I update the email throughout the week, adding and deleting tasks or moving them to other days as my schedule and priorities shift. And because I love the physical act of crossing items off my list, I end each day by jotting down the next day’s to do list items (including any mtgs on my calendar) onto a big post-it pad on my desk so I can cross off each task as I complete it. This also helps me to leave the office feeling prepared for the next day and encourages me to stay on task in the mornings – I just review my list and get to work. I keep a running list in an email draft of ‘To Do’s,’ ‘Waiting On’s’ and ‘Completed.’ I try to keep the list limited to only the very next step. So if my ‘to do’ was ‘Project A: Write draft’ then I’d delete it from that list and add to Waiting On, ‘Project A: Feedback on draft from the boss.’ I’ll add any to-do’s from emails and meeting notes directly into that doc. I scan the list throughout the week and review it on Fridays more in depth for the week ahead. I’ll use my calendar to schedule reoccurring quick tasks or follow-ups that are several weeks out. But I try to minimize those because I tend to forget about a task after the meeting pop-up stops. I tried an add-on to Outlook called Boomerang to track emails without responses but emails got lost and it didn’t ultimately work. But! But, I now keep a folder called “boomerang” on outlook where I put any emails that have open items and need to be followed-up on. Every Monday I go down the emails to send all of the follow-ups, and if I don’t need to follow-up, I drag the email into another outlook folder for that project/client. Then I check it periodically during the week. I just discovered this and it is brilliant – no fancy add-ons needed. I’m glad to see that I’m not the only one with a system that’s…let’s call it, “multi-layered”. I keep a whiteboard that I’ve divided up into 6 sections using washi tape. Each major project has its own section, plus one with miscellaneous to-do items. I like this for quick reference of big picture project statuses. I also have a planner to track weekly and daily to do’s. Right now I’m using the Passion Planner which I really like, but I’m thinking about switching it out for the Daily Greatness Planner. I like using my planner because it helps me to set goals and keep them at hand in a visual way. I will admit that it does take some time, but I find the reflection of the past week and goal setting for the upcoming week to be worthwhile. I usually carve out some time on Friday to update the planner. For digital “To Do’s”, I’ve been using a gmail skin called Sortd. It allows me to drag and drop my emails and place them in different categories on a board. My categories are To Do, Follow Up, Reminder, and File. Once I’ve placed an email on the board I can add notes to the email in a handy margin area, set a reminder on an email, or add a calendar event for it. I like this skin although I will warn you that it can be buggy at times. I am known as a detail’s girl! I have a list that I maintain in MS Word. Every time I complete something, I cross it out, useing strike through function. So I still have it on the list but with a strike through. I can always UN-Strike through it in case it comes back up, so I know where I stand with an issue. I then upload the file to our firm’s server so I can access it from home or from work, and from any device! YAY!!!!!! These are great tips that I definitely need to try! My brain is all over the place daily and I have to figure out a way to organize my thoughts and ideas! Can’t believe nobody has mentioned Teux Deux! (It’s at teuxdeux[dot]com.) PLEASE use and support this fantastic tool! Iphone app, but you can just leave it open in a browser window on Android phones. The web site is fantastic, you can schedule recurring to-dos (birthday reminders!) as well as keep a “someday” list, it’s easy to move entries around, it automatically rolls things over to the next day, and you still get the joy of crossing off. I realize it’s not secure, but I see little risk in putting something like “start bridge brief” on the Teux Deux for, say, next Thursday. Even a file number (under my firm’s system) contains no easily discernible client information. The beauty of the system is that once something’s on the “list” for a later date (“book parking for conference event”), I can forget about it until that date rolls around. I’m a bit of an organization freak, and this is easily my favorite web tool, by far. I love my bullet journal. I use Outlook for emails (and email files) and to schedule and track meetings, but everything else is in my bullet journal. Also, mine isn’t fancy or “artsy” like some you’ll see on social media sites. I suggest searching Instagram with hashtags #bujopro #bulletjournalpro to see project management/business-friendly layouts. I tend to do weekly layouts, but thinking of breaking this down further to daily journaling to track my progress on more granular level. But I won’t update my to do list more than once — I just leave plenty of white space to allow add-one during the week.